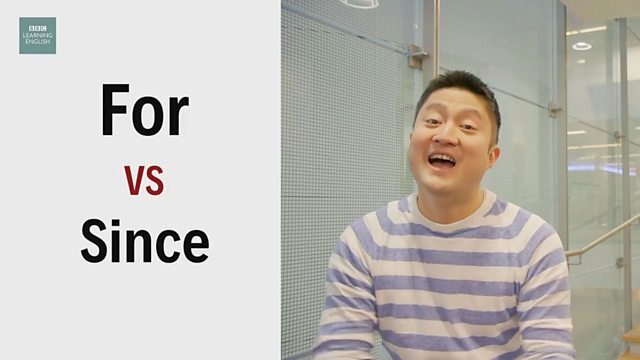 In today's One-minute English Kee will explain how to use ‘for’ and 'since'. आजच्या One-minute Englishमध्ये की तुम्हाला 'for' आणि 'since' चा वापर कसा करायचा ते शिकवणार आहे. 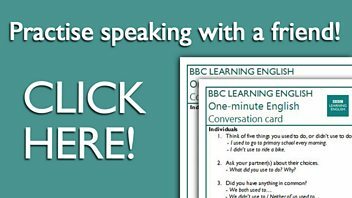 Hi guys, this is Kee from BBC Learning English. Today I'm going to tell you how to use 'for' and 'since'. We use 'for' to describe how long an activity or a situation lasts. For example, I can say 'I go running every day for 10 minutes' – that's not true though. On the other hand, 'since' is used to describe when an activity or a situation began. For example, I can say 'I have been recording this video since 10 o'clock'. So, remember 'for' is used to describe how long an activity or a situation lasts, whereas 'since' is used to describe when an activity or a situation began. एखादी घटना, परिस्थिती किती काळ टिकेल किंवा घडत राहील हे सांगण्यासाठी 'for' वापरतात. I go running every day for 10 minutes. I try to read for a few hours on weekends. एखादी गोष्ट कधीपासून सुरू झाली किंवा कधीपासून घडत आहे हे सांगण्यासाठी 'since' वापरतात. I have lived in this country since 2012. Since last year, I have been collecting coins from different countries. Both 'for' and 'since' are prepositions, so are followed by a noun phrase. 'For' आणि 'since' ही शब्दयोगी अव्ययं आहेत. ती नेहमा नामाच्या आधी येतात. 'For' is always followed by a noun phrase that expresses a length of time. 'Since' is always followed by a noun phrase that expresses a point in time. तुम्हाला काय काय समजलंय या भागातलं? चला या प्रश्नांची उत्तर देऊन तपासू. 'since' सोबत कुठल्या प्रकारचं नाम वापरतात? I have been travelling around the world since ___________. 'for' सोबत काय वापरता येईल? Everyone's been working non-stop for ____________ to complete this project. किती वेळ घटना घडेल ते सांगितलं आहे. त्या माणसाने दुपार'पासून' वाट पहिली आहे. . I've been waiting for his phone call ___________ noon. • I have worked here since 2012. We can also use the present perfect continuous to talk about the same thing. • I have been working here since 2012. • I have been working here for 6 years.